The journal was founded on 2nd December 1967, at Iaşi - Romania. It has begun its activity in 1968 within the Agricultural Research Station of Podu-Iloaiei, Iaşi County, in co-operation with the research stations from Moldavia and the Agronomical Institute of Iaşi (today, University of Agricultural Sciences and Veterinary Medicine of Iaşi). 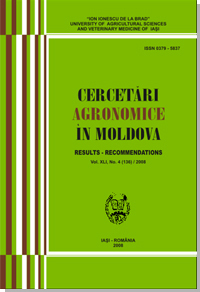 Since 2006, Cercetări Agronomice în Moldova (Agronomical Research in Moldavia) is being published under the aegis of the University of Agricultural Sciences and Veterinary Medicine of Iaşi-Romania, at the "Ion Ionescu de la Brad" Publishing House. Along its activity, the journal aims to covers many areas related to agricultural research, in order to apply in practice scientific results. "Cercetări Agronomice în Moldova" is a quarterly peer reviewed journal publishing original, experimental and technical articles, in basic and applied research, covering a wide range of topics in agriculture scientific research, dedicated to promoting and to dissemination of scientific knowledge. "Cercetări Agronomice în Moldova" is an open access journal, whose papers on scientific research results carried out by the research agricultural institutions and high agronomic education are on potential interest to a significant number of scientists. Articles are published in English.